Bill McKibben writes that “I have pretty much given up on the word ‘wild’… We need a more honest word to describe places where people are not in total control yet have their thumb on the scale.” At the risk of confusion, I’d suggest that the term already exists – Canada – a country tamed. In Europe and elsewhere, Canada has traditionally been a euphemism for unexplored, uninterrupted spaces, but we Canadians know better than that; the wilderness has been carefully manicured, and conceals a threat: its native species disturbed and sometimes even eliminated, pristine spaces severed by the roads which serve as the arteries of our extraction-based economy, dark materials once hidden deep below the earth – uranium, mercury, aluminum – now dislodged and brought into the water and the atmosphere. Our wilderness is no wilderness at all – even our most peripheral spaces, the Arctic tundra, are crisscrossed with the tracks of heavy all-terrain vehicles, while every day corporations survey these remote sites in pursuit of untapped resources to extract. Every inch of this land has been accounted for. In his recent paintings, Christian McLeod is engaging directly with the historical changes taking place in his homeland, both the first epoch, wherein wilderness was turned to pasture, and the current epoch, where that which was below the ground is brought to the surface. McLeod has been addressing political issues in his work since his early involvement in the underground rave scene of the late 80s, and more recently his monumental painting Further Unmanned Strategies (2008) was an exploration of surveillance and post-9/11 paranoia focused on his experience of London, its black helicopters circling Saint Paul’s Cathedral, but the recent work seems less overtly political, and more concerned with our own passive acceptance of, and movement towards, an uncertain future. In conversation, McLeod has argued that the environmental changes seen in his lifetime are unprecedented, and happening at a pace that outstrips anything seen in the past, that we have reached a sort of tipping point, beyond which there is no return – whether this is the case or not matters less than the fact that it affects McLeod’s worldview, as seen indirectly through his paintings. His surfaces are pockmarked with railroad tracks and the residue of heavy vehicles, fumes rise up – these are the traces of traffic and modern life. In paintings such as Central Station (2009), the buildings seem more tenuous and temporary than the tracks between them – movement is the only certainty in these scenes, as even the name of the painting suggests. The signs and symbols of McLeod’s Invisible Cities (2009) – those monstrous future sprawls still waiting to be built – stretch out in every direction over the canvas and beyond, and Clifford Still Banks (2009), a shadowy gray and black tribute to the American artist, eerily echoes Edward Burtynsky’s photographs of Sudbury’s devastated landscape, its rivers turned a rusty red from nickel tailings – the painting’s black river teems not with life but with menace. With McLeod, however, there is a certain detachment, he declines to comment on the cost-benefits of change, since he himself – dwelling half in the country, half in the city, dividing his time between growing food on an organic farm and eating at the city’s best restaurants – is as much beneficiary as victim of these phenomena. My father, a country boy from Cape Breton, went to the mines in Sydney, Nova Scotia, when he was about 25. He died of silicosis at the Mount Hamilton Sanitorium in 1932 when he was 42, leaving a wife and seven children. I ate lake trout for supper last night! Again and again, McLeod turns to the theme of home; whether it is the chicken he raised himself, miraculously spared from the predations of a marauding dog and immortalized in the Lucky series (2006 – present), or the bucolic imagery of works such as River (2010), or in another form in Rising Harbour (2010), which explores the encroachment of night while throwing out kinetic imagery, the viewer is looking for the way home through a crowd of symbols and allusions. McLeod has moved frequently since his childhood, with extended time spent in Spain, Germany, New Mexico, and Belize, as well as many parts of Southern Ontario, and has followed the migratory patterns of artists in Toronto, who first discover and revitalize a neighbourhood or warehouse building before being priced out of it and forced to move on. Despite, or perhaps because of these travels, in both temperament and practice, he is thoroughly Canadian, independent yet not enamoured of individuality for its own sake, a diligent recycler, of both consumer goods and imagery, traditional enough to still work in oil on canvas, yet determined to create something new. I shall attempt to define a conversation between McLeod and three interconnected generations of Canadian art, each exemplified in a few key individuals, because a conversation involving only a few people, with everyone listening to everyone else and taking time to think and not spouting, tends to be more productive or at least more relaxed than a mass conversation, which runs the permanent risk of becoming a rally, or, because of the necessary brevity of the speeches, a series of slogans that fade as soon as they are put into words. Working backwards from the present, the first figure we encounter is Edward Burtynsky, a near contemporary of McLeod, only ten years his senior; the two artists share an abiding fascination with human intervention in the landscape. At its most extreme, Burtynsky’s works depict places that seem lunar in their devastation while remaining terrifyingly earthly, as in his pictures of Eliot Lake’s uranium mines, but he is capable of a certain sweetness too, and of childlike wonder at the epic scale his camera captures – witness the Carrara marble photographs from the Quarries series, where heavy equipment is miraculously transformed into children’s toys. I visited the 2009 Burtynsky – Oil exhibition at Toronto’s Metivier Gallery with McLeod to get his impressions of the work, and he seemed in awe of the photographer’s access to helicopters and light aircraft; while much has been made of McLeod’s imagery of helicopters and drones – pace Grande and Dault – less has been said about his preferred vantage point, which is almost always elevated above the scene depicted, as if in an aircraft or positioned atop an incredibly tall scaffold (both photographic strategies, though McLeod does not usually work from photographs), the same panoramic, all-seeing, Godlike position Burtynsky uses in many of his images. This strategy is laid bare, and explicitly entitled, in the recent Control Room (2009), which depicts a receding grid of scorched earth such as might be seen from the video feed of an unmanned drone following a successful bombing raid. At least as far back as the pair of St. Henri paintings he created in 2006, there has been a vertiginous quality in McLeod’s composition, whereby the painting can either be read conventionally in the sense that the horizon point is in the centre or darkest point of the picture, with all other points closer to the viewer, or it can be seen almost as a scroll, read from top to bottom or left to right, with darkly-drawn images floating above a coloured background, where all marks are equal in distance, vaguely textual, and the viewer sees the landscape as if through a screen with hieroglyphics on it, the signs falling through space. In the recent work, this effect is more refined, as McLeod leaves behind the grid in pursuit of a massive, immersive, all-at-once space, as seen in Central Station or Passing Over, the surface density seemingly so heavy that most of its mass has been pulled down to the lower areas of the painting by gravity. Richard Gorman has been described by Roald Nasgaard in his definitive tome Abstract Painting in Canada as “perhaps the quintessential Canadian artist.” At seventy-odd years, Gorman continues to paint and exhibit, and as a longtime friend and sometime mentor of McLeod, his reductive process, his musicality of composition, and sheer doggedness in pursuit of his obsessions have all made a deep impression on the younger artist. McLeod has learned this lesson well: rising early most days, diligently cleaning his brushes and knives and preparing his palettes before attending to the task at hand, he is the antithesis of the cliché of the artist who paints in a frenzy and then walks away from the canvas, as if awakening from a dream. His process is cumulative, paintings may take months or even years to burst forth in full flower, they may change with the seasons, and McLeod tends to them like a gardener, removing those parts which seem inert or lifeless, nurturing the surface with a mixture of detachment and complete involvement, but above all letting the pictures become their own being-in-the-world. Entire paintings have seemed finished, only to have their surfaces scraped away and begun anew because of some sense that a purer form was attainable. A painting such as Foliage (2007-2009) has, at different points in its journey into being, been predominantly dark blue, then a weird pistachio green, before finally resolving as a vermillion and grey sunburst, somehow both completely unlike and yet also the inevitable end result of all its previous states; during this time, McLeod has resisted requests to exhibit and even to sell the piece, waiting until it becomes itself before unveiling it. A generation prior, two artists to whom McLeod is often compared, Riopelle and Borduas, loom large. It is tempting to find a correlation between McLeod’s vibrant palette knife gestures and those of Riopelle, but there are distinct differences that I believe render the comparison inaccurate – for one, Riopelle seemed acutely aware of the boundaries of his supports, his seemingly spontaneous compositions always stopping a hair’s-breadth from the edge of the canvas, whereas McLeod’s imagery seems more like a window onto another world, providing a carefully selected view of a scene that continues out in every direction beyond the limits of the canvas. Further, Riopelle, to my eye, tended to work at times with the painting on the floor, creating it in the round like many of his contemporaries, whereas McLeod is resolute in the easel-based horizontality of his compositions, perhaps in order to attain that vertiginous aspect described earlier. There is not a lot of paint dripping in a Riopelle, gravity has been subsumed to the artist’s filigree gestures; as such, I do not think Riopelle has much to add to a conversation about McLeod’s work. On the other hand, visiting the Automatisme: A Revolution in Painting exhibition at the Varley Gallery in Unionville at the end of 2009, I could not help but be stunned by the parallels in the development of McLeod’s work with that of Borduas. Borduas’ The Amphitheatre of Leticia (1953) seems the midwife to McLeod’s Sodium (2009) – the same slashing gestures and milky palette of whites, greys, and pinks carry on from one to the other. McLeod’s Particles series (2003 – present), red blobs on a white ground, cannot be considered without comparison with Borduas’ best-known works, the black blocks moving through pristine white painted a half-century or more ago, paintings such as Bercement Silencieux (1956). McLeod, of course, readily acknowledges Borduas as an influence, but believes the case has been overstated, his inspiration for the Particles came not from art history but from some oddly-shaped stones sticking out of the water on the shores of Lake Huron near his mother’s house; as always, the influence is assimilated, then mixed with experience before spurring action. The last, and perhaps strongest, influence I draw into this conversation is David Milne, an artist who stands as something of a hero to McLeod, equally for his willingness to toil for a long while in relative poverty and obscurity, as for his wanderings through Europe and America which eventually led him home, and for the brilliance of his whites and the economy of his technique. McLeod has acknowledged Milne’s antedated minimalism as a strong influence on the emergence of his mature style, which is unsurprising since Milne is an artist McLeod has studied at length, in exquisite reproductions from auction catalogues collected at great expense and in visits to the AGO’s extensive collection, both its original holdings and those pieces recently bequeathed by Lord Thomson. Milne too is an artist for whom the idea of home seems paramount, painting his hearth or the alleyways or fields around his dwellings, even his breakfast table. Added to that there is his diligence, that vocational quality to the painter’s practice, a certain artisanal humility that connects Milne to Gorman to McLeod, and insists on the primacy of the handmade, of the almost ecclesiastical presence of the artist, alone in his studio, ignoring art-world trends in favour of the same complex motivations that have driven artists since the dawn of the practice. I trace the emergence of McLeod’s mature practice to Milne via Gorman and Borduas, yes, but also to a story he told me once about his childhood, when he would run into his parent’s bedroom on a weekend morning and lounge in bed with them, looking at the curtains and watching the light stream through their abstract foliage pattern of overlapping leaves of different colours, green, brown, and purple, imagining faces and objects in the patterns and in the negative space between them. Perhaps those childhood memories go some way to explaining the gauzy, flickering, intermingled view of the world he captures on his canvases, his images suggestive of a million points of entry, of shapes that demand yet resist interpretation, of stories imagined but beyond the capability of words to tell. I recently attended a party at which the hostess sat down at the piano and played a long recital for her guests. In its immediacy and impermanence, it seemed the most beautiful gift she could bestow, and I felt honoured to be there. In an era of abundant recorded music, most of us have lost the ability to play an instrument or to sing, and as such we have lost the connection between hearing music and making music in our own lives – we no longer know the words and melodies of a common songbook and instead have become consumers of omnipresent sonic wallpaper. As Nietzsche wrote long ago, music has become like architecture to modern life, it surrounds us everywhere we go, it has become as pervasive as the air we breathe and like the air we hardly notice it (except, perhaps, in its absence). The same may well already be true of visual imagery: as Eric Fischl and April Gornik observed, the camera, and subsequently the Internet, has rendered almost all works of art accessible with a few mouse clicks and well-chosen search terms, yet the image on the screen can never approximate the real artwork, since it lacks scale, texture, and above all the ineffable presence of a hand-wrought object. To stand in front of an artwork, or to hear a well-tempered instrument played, is an experience utterly different from seeing or hearing the same ‘data’ transmitted via mediated mechanisms. McLeod has spoken at length about the inherent irreproducibility of his work – the textures of paint inches thick in parts, the precisely calibrated variations in colour across twenty or more square feet of canvas, which are reduced to six by six inch images at seventy two pixels per inch on a flickering computer screen – but beyond technical details, what cannot be reproduced without loss is the gift, that intimate and unmediated conversation between artist and viewer, person to person, reaching out across vast distances and different eras to say I made this. 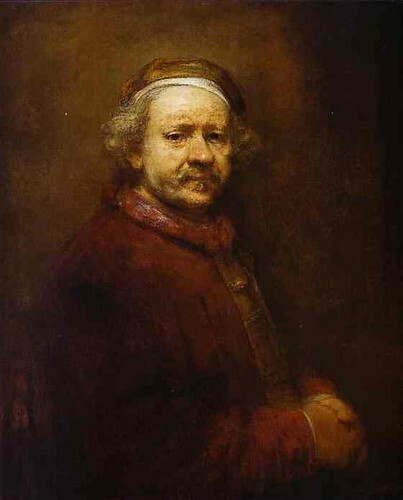 Whenever I am in London, I seek out Rembrandt’s Self-Portrait As An Old Man, which to me seems to exemplify this gift-giving sensibility; the artist’s eyes gaze into the eternal present, he is old but forever the same age, it is me who is getting older now. Rembrandt’s concerns have become mine, and he looks out in sympathy and understanding. The most memorable paintings capture a moment in time, and also manage to speak to something eternal, and in his finest works, having moved beyond anxieties of influence into a mature practice, Christian McLeod extends these vital and enduring conversations – how should we live? what is it we want? – forward into the future.